« Cinco de Mayo Celebration at Casa Guadalajara Is The Best In San Diego! 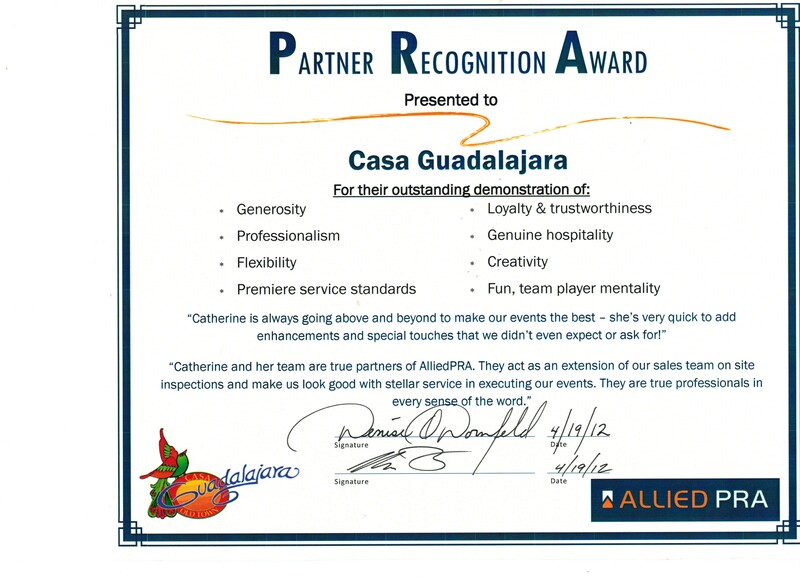 Casa Guadalajara Special Events Director Catherine Breedlove and her team were surprised to receive some very special recognition from Allied PRA this morning. At Casa Guadalajara and Bazaar del Mundo we see every day all of the extra effort Catherine and her team put into everything they do. Every event is very special in Catherine’s eyes. This recognition was very well deserved, and it was very classy of Allied PRA to do so. On the certificate it say’s, “Catherine is always going above and beyond to make our events the best…she’s very quick to add enhancements and special touches that we didn’t even expect or ask for!” That really sums up Catherine’s work ethic and ingenuity. We are all very proud of you Catherine. Thanks for all you do! This entry was posted by The Guadalajaran on April 20, 2012 at 1:45 am, and is filed under Blog Entries. Follow any responses to this post through RSS 2.0. You can leave a response or trackback from your own site.